Floral crochet coaster hot pad. 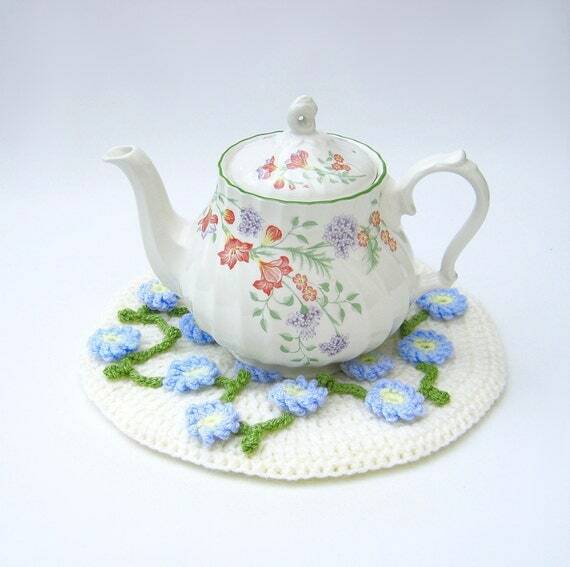 crocheted flowers teapot stand doily table mat in cream with blue forget me nots. This beautiful teapot stand has been crocheted in chunky cream yarn in a circular design adorned with an array of pretty blue hand crocheted forget me nots. Fully washable up to 30 degrees, do not tumble dry, dry flat, reshape while damp. Folksy :: Buy "Pinky Cotton Star Flower Doily / Coaster"
Folksy :: Buy "Crochet Christmas dark pink coasters set of 5"
Folksy :: Buy "Christmas Purple large crochet doily."